For the filling, peel, core, and cut the apples into eighths. Cut each wedge into 3 chunks. Toss the chunks with the orange zest. 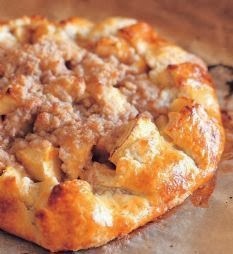 Cover the tart dough with the apple chunks leaving a 1 1/2-inch border. Combine the flour, sugar, salt, cinnamon, and allspice in the bowl of a food processor fitted with a steel blade. Add the butter and pulse until the mixture is crumbly. Pour into a bowl and rub it with your fingers until it starts holding together. Sprinkle evenly on the apples. Gently fold the border over the apples to enclose the dough, pleating it to make a circle. Bake the crostata for 20 to 25 minutes, until the crust is golden and the apples are tender. Allow to cool. Serve warm or at room temperature.